By end of April, 2017, 65% of RWH tanks, built by Councils’ communities, on a voluntary basis, were completed, thanks to the Mayors of the Councils involved and the willing community members. “I am happy with the communities that have completed their tanks, as they have clean rain water for their use that will improve the health and well-being of their children,” commented the UNICEF chief. However, some Councils were not able to complete their systems, due to the delays in the provision of materials. Some of these were short-landed or misplaced and never ended up where they were needed. 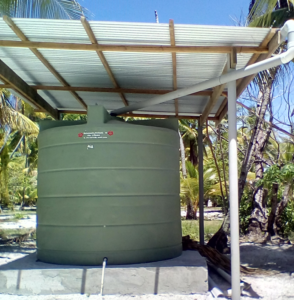 The fact that many communities were able to complete their tanks by freely giving their labour and local resources is seen as a good practice and needs to be encouraged since it allows for greater ownership of the projects, thus making them more sustainable. One notable indicator of the usefulness of the tanks is the telltale footprints that have cut out distinctive footpaths to the taps of the completed RWH tanks for water collection. Many of these are children’s footprints. KiLGA takes this opportunity to commend Mr. Cromwell Bacareza and his hard working staff at UNICEF for providing the funds and tanks for the benefits of the local communities and their children. 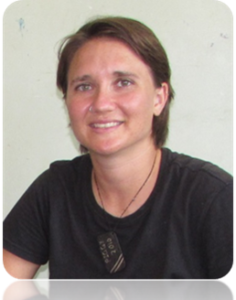 26 April, 2017 – Annah Piggott-Mckellar; a PhD Student from the University of Queensland, Australia, visited KiLGA to seek guidance and information relevant to her area of study. Ms. Piggott-Mckellar said her research focused on Climate Change adaptation and development, especially on the outer islands, including Abaiang, where the Whole of Island (WoI) approach has been applied to produce a detailed technical vulnerability assessment and a matching Strategic Plan for the Abaiang Island Council. Both documents have a strong focus on Climate Change Adaptation. 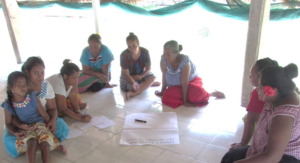 KiLGA was one of the key partners in the Abaiang WoI Approach project which drew its funding and technical resources from many donors and agencies, including SPC, SPREP and the German government’s Deutsche Gessellschaft fur Internationale Zusammernarbeit or GIZ. A gathering of residents of Bikenibeu East Ward, (Kootiwei), took place in mid-April 2017, at their Catholic Mwaneaba to review the previous Teinainano Urban Council (TUC) Strategic Plan and provided visions and issues for a new one for 2017-2020. The 40-strong group, that included youths and preschool teachers, was very vocal and expressed pressing issues facing them including lack of fresh water, the need for fishing passages, sports fields, access roads and preschools registration. Meanwhile on 30 April, at Santaake Mwaneaba, Bairiki, another team from the TUC visited the Santaake Group, a Catholic community at the township, to collect their views and issues that they face that should be included in the same plan. The group identified key issues for their community as being, lack of dog control, need for good access roads, inadequate fresh water, absence of flush water for toilets, need for fishing boats for their unemployed members and waste management. One of the two Bairiki Councillors, Teririko Anre, attended the consultation. 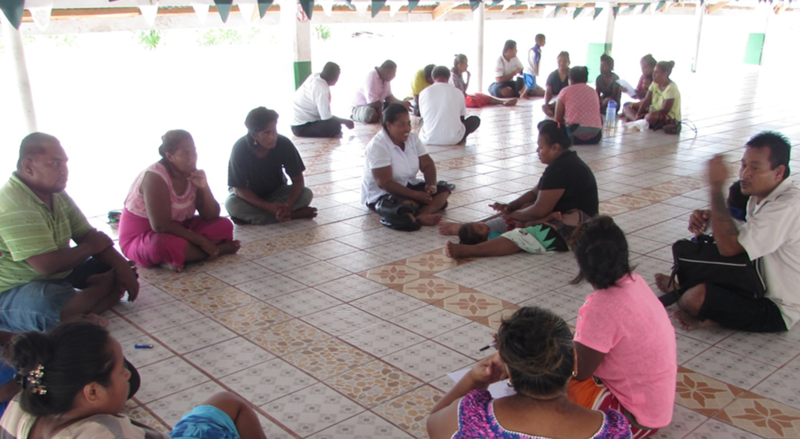 Female members of the Santaake group in Bairiki, discussing issues for the TUC’s new SP. The government’s approved motion to arrange for a $70m loan from the World Bank is welcomed by Councils because it would provide for the building of new infrastructure and the maintenance of existing ones, including causeways, airports, wharves and jetties. It is a timely implementation of the government’s ‘Motinnano’ or visionary strategies that will see an investment in the rural areas and a boost to their economies. In his speech to Parliament, the Minister of Finance, Hon. Dr. Teuea Toatu, (pictured), said that the loan would “strengthen and develop the outer islands … and provide employment for people there”. The money would also be used for communication (internet) infrastructure and government building maintenance on the outer islands. 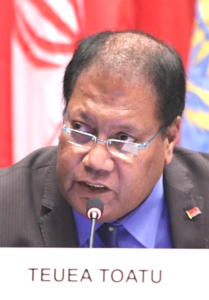 The Minister explained that the move is a way of speeding up the World Bank’s grants of the same amount that it has committed to provide to Kiribati. 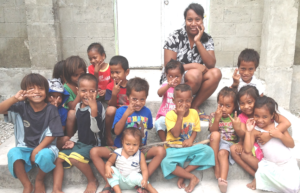 The loan would be more affordable to Kiribati than a drawdown of the RERF given the low interest involved. Councils welcome this initiative by the central government, because of its many benefits to their communities. However, given the large amount of money involved, proper transparent and legal mechanisms are needed to avoid abuse and ensure Councils benefit. 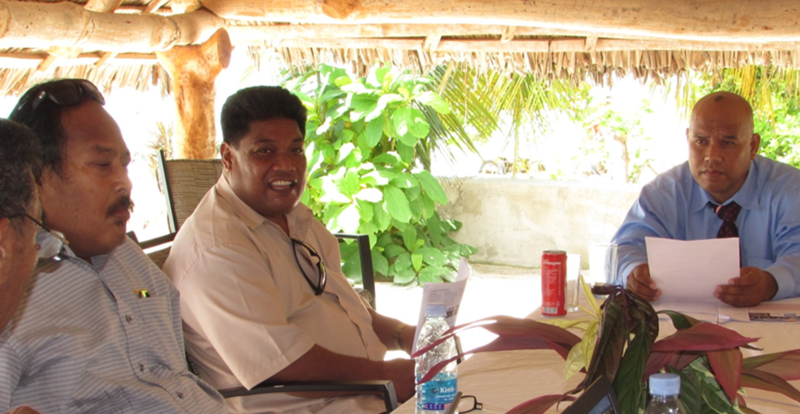 24 April, 2017, LMTA’s Koakoa Restaurant, Antenon – The KiLGA’s Executive Board held a meeting with the Minister of Internal Affairs, Hon. Atarake Natara, to update him on the outcomes of the UCLG ASPAC’s Executive Bureau Meeting, held in the Philippines that KiLGA and MIA attended. The meeting also discussed other matters that were considered relevant to the Parliament session, currently in session. The Minister was accompanied by his senior staff, Moote Korina, Deputy Secretary, Eliza Tokataake, Urban Management Officer and Emma Nauan, Senior Assistant Secretary. Among issues discussed was the request by KiLGA for a sublease for its office space and for the Councils Reserve Fund. 21 April, 2017, Utirerei Restaurant, Ambo – Whilst Parliament was nervously discussing cases of corruption from amongst its ranks, from reports released by the Select Committee on Anti-Corruption, a stone-throw away at Utirerei Restaurant, members of the National Anti-Corruption Committee, comprised mostly of government officials and representatives from several NGOs, were sharing information with visiting anti-corruption specialists, Ms. Mikaela Stojkosus and John Hyde of UNDP in Fiji and Tongan MP, Lord Fusitu’a, chairman of the Tongan government’s Standing Committee on Anti-Corruption. The Kiribati Anti-Corruption Chairman, Terieta Mwemwenikeaki, welcomed the visitors and introduced the Anti-Corruption Strategic Plan developed by the Committee. Ms. Stojkosus reported that they had reviewed the Plan and noted outstanding areas and those that require improvements. KiLGA, a founding member of the Committee, has also received some assistance from UNDP over the years on various projects, with the most recent being the ‘Local Government’s Anti-Corruption Calendar 2017’, that provides information on all Mayors and included anti-corruption quotations and cartoons. Parliament passed the Early Childhood Care Education Bill, in its April sitting, marking the formal take over of the preschools by the central government. This is a great historical leap for early childhood education which has been under the control of Councils and private operators and churches for many decades. 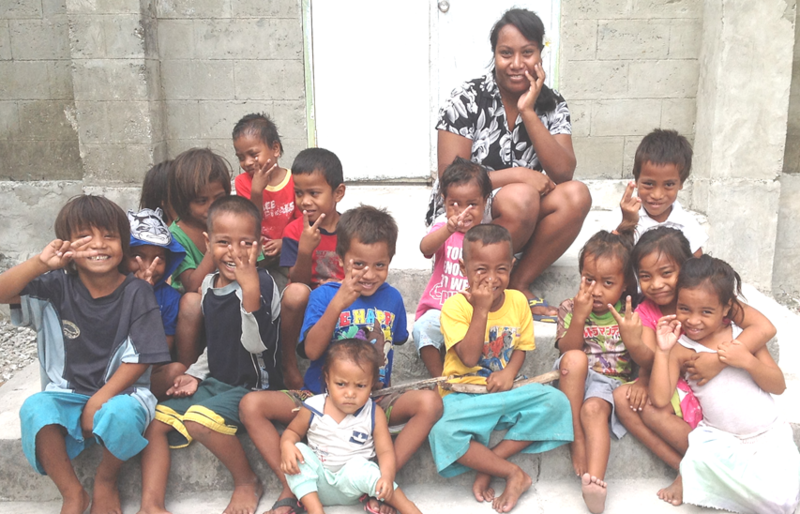 Most councils in Kiribati, run preschools by providing salaries for the teachers and required resources. The table gives the number of teachers by Council and their total annual salaries, based on 2013 figures, provided from the Ministry of Internal Affairs. Note that TUC, Kuria and Banaba have no preschool services. The ECCE Bill was drafted by the Ministry of Education and involved various consultations, one of which was held in early 2017, involving all 23 Mayors and their Clerks. During the UCLG ASPAC’ Executive Bureau Meeting, at Catbalogan City, Philippines, the KiLGA’s delegation attended three landmark events—the ‘EE Rating Workshop’, the ‘Panel Discussion on the SDG and NUA’ and the establishment of the ‘Belt & Road’ and the ‘Maritime’ Committees. The City and Local Government Enabling Environment Assessment (EE Rating) Workshop—The EE Rating workshop took place on the 4th April, 2017 at the San Francisco Hotel, where reports on EE Ratings from 23 countries were reviewed. The ratings were based on 12 criteria against which a City’s and Local Government’s enabling environment are assessed. The criteria range from ‘Constitutional Framework’ to ‘Women’s Involvement’. 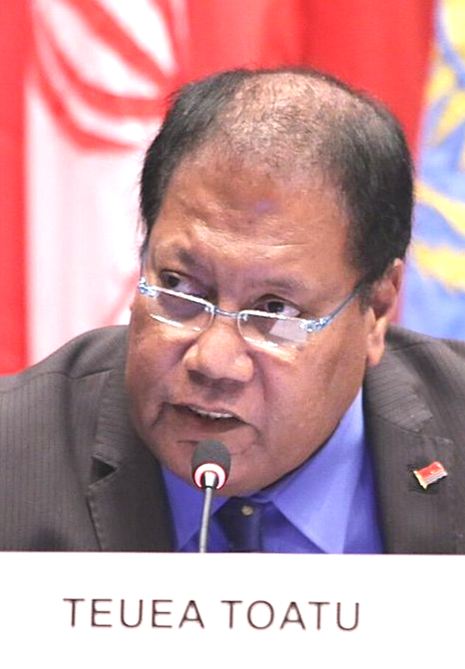 The Director of the Commonwealth Local Government Forum Pacific, Karibaiti Taoaba, who is based in Suva, Fiji, has advised that the EU has provided the second tranche of funds to allow three LED projects in Kirbati to commence. 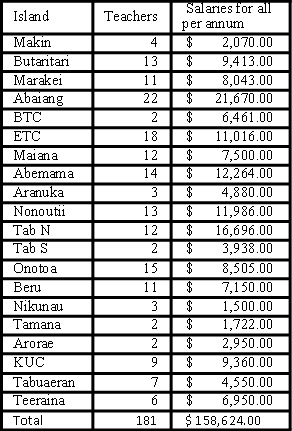 The money will be used for LED projects for three nearby Councils of Betio Town Council, (BTC), Teinainano Urban Council (TUC) and Eutan Tarawa Council (ETC). BTC will start the ‘Pig Meats’ project, to slaughter local pigs and sell as pork and other bi-products; TUC has yet to decide on its project, while ETC will start a Chicken Farm. The LED projects first started in 2105, but were made pending when the EU undertook an evaluation of the project in 2016. About €5,000 is earmarked for each of the three LED projects. The Chairman of KiLGA, Mayor Taoaba Kaiea, and the Executive Officer, represented the Association at the first Executive Bureau (ExBu) meeting of the United Cities & Local Government for Asia and the Pacific, (UCLG ASPAC), from 5-6 April, 2017, in Catbalogan City, Philippines.